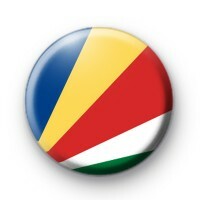 This listing is for a 1 inch button badge of the Seychelles National Flag. The Seychelles is an archipelago of 115 islands in the Indian Ocean off East Africa & is an idilic paradise popular with honeymooners & holiday makers. Known for its glorious sandy beaches and beautiful warm climate. Their national flag is quite colourful and made up of red, white and green which are the official colours of the SPUP (Seychelles Peoples United Party. Our world flag badges are great for sporting events, schools and anyone thats patriotic.